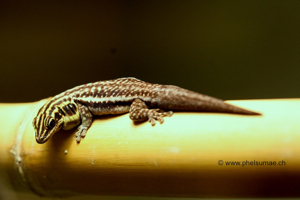 Phelsuma malamakibo reaches a size of about 140mm in total length. It is identified by the presence of a distinct dark lateral stripe on the neck and body with a white lateral stripe below it as well as a second thin dark stripe underneath the white one. The basic dorsal color is greenish with reddish brown spots arranged into three longitudinal rows on the neck and back.The ventral color is filthy-white. 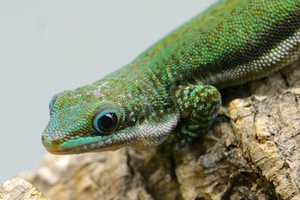 Phelsuma pronki, described in SEIPP, 1994, (Senckenb. biol, Frankfurt am Main, 74, 1/2. 193rd) is named for the explorer Olaf Pronk. The gecko was originally described based on several types: the Holotype is at the Senckenberg Museum, Frankfurt am Main, Germany (SMF 75 950); the Paratype is at the Museum of Zoology, Dresden, (D 35 785).